Hook’s Heroes is a cartoon-style video pokie, released by Net Entertainment, and a very quirky, but comical take on the legend of Captain Hook from Peter Pan. Hook’s Heroes features a smorgasbord of pirates, each with their own unique personalities. The idea behind Net Ent’s Hook’s Heroes pokie is that it will be quite unlike any other pirate themed pokie machine currently available on the market. Hook’s Heroes features just 20 paylines spread over its 5 reels. The game will allow players to choose coin sizes of 0.01 upwards to 1.00, with the possibility to stake up to 10 of those coins per payline. Players are going to find that at its cheapest, Hook’s Heroes will set them back just a minimum bet of 0.20 per spin. That’s not too bad, and easily affordable by everyone. 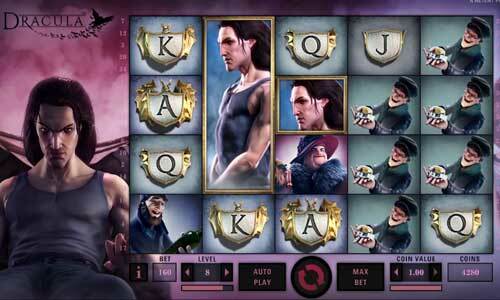 Hook’s Heroes features a maximum wager of 200.00 per spin. Paylines cannot be adjusted in this game. Wild symbol: Wild symbols take the shape of a pirate’s hat, and they are pretty basic icons in this game. They can replace all other symbols, barring special icons, and they can appear on all 5 of the pokie’s reels. Scatter icon: If a pirate icon has the word “scatter” underneath it, you can take that to mean that it is a scatter icon. Players can trigger a bonus round if they land 3 or more of these scatters in any position on the reels. Free spins: Players who trigger the free spins bonus, will have a choice to make before they get to enjoy their spins. Landing 3 or more scatters is enough to let players pick from 3 special bonuses. However, the more scatters they get, the more bonuses they will be able to utilise, either in or after the free spins bonus. The free spins bonus itself consists of 10 free games, with all winnings doubled. Winnings will be quadrupled if they feature wilds, and additional free spins can be won during this bonus round. Hook’s Heroes contains a maximum jackpot of 194,800 coins, but you will need a bit of luck in the free spins bonus to land that kind of money. In the base game, players can win the non-progressive jackpot in Hook’s Heroes by lining up 5 of the bandana wearing pirate symbols on any payline. This should allow you to scoop a win worth 900x your total stake. Hook’s Heroes has a RTP of roughly 96.82%, and that is pretty decent for any video slot. 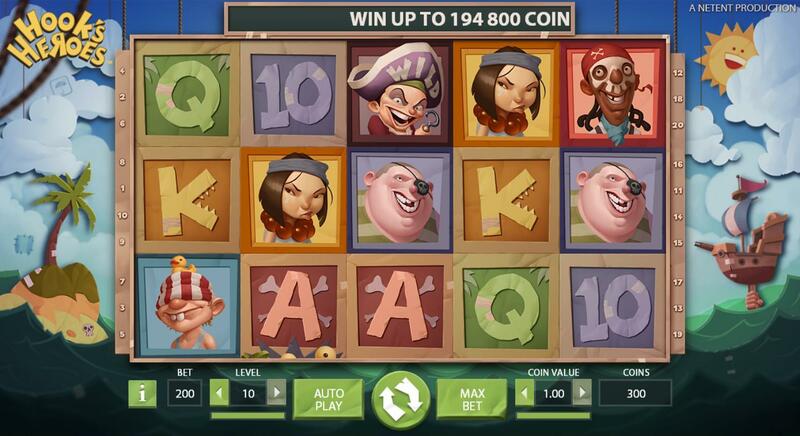 In terms of design, Hook’s Heroes is going to be a real hit, as there really is no other pirate slot on the market to match it. That being said, from a gameplay perspective, the slot is hardly unique. 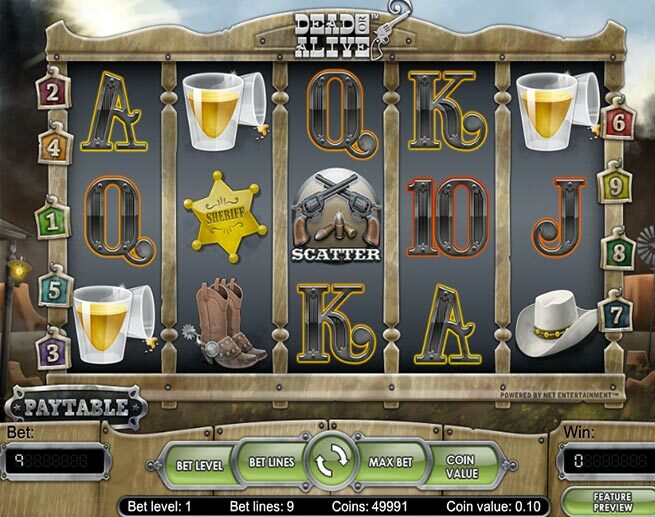 All of its features can be found in many other slots – pirate themed or otherwise. In short, it is best to describe Hook’s Heroes as just another slot, although a very good looking and entertaining one at that.